- Special Size Also Available. 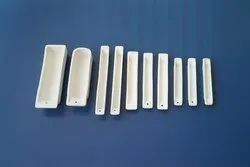 Banking on our enriched industry experience, we are able to supply Alumina Boat. We provide to our clients best quality Alumina Boat They are used for melting metals and also for measuring carbon and sulphur percentage in steel in combustion tubes of muffle furnace of carbon and sulphur apparatus.